Many of us want to make money on our own terms. It’s tempting to start a home business with the hope of creating a little income diversity, or even of building it to the point that you can quit your day job altogether. However, running a home business isn’t for everyone. If you are just looking for a couple hundred extra bucks a month, you might not need to worry too much about how “serious” you are about it. On the other hand, if you want your home business to be a part-time or full-time income, things get a little more interesting. 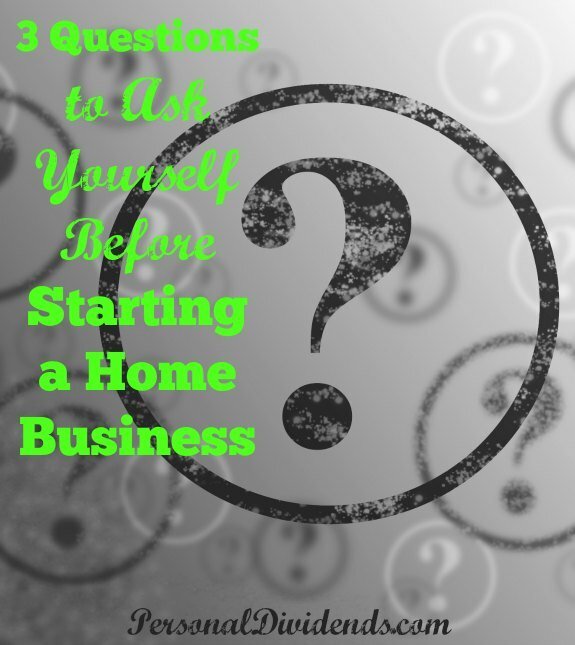 Before you embark on the journey of the home business, here are 3 questions to ask yourself, and make sure to answer them honestly. 1. Do You Have the Discipline to Put in the Work? Starting a home business isn’t easy. It’s hard work. Not everyone is cut out to make it happen. If you want to succeed, and especially if you want to make a significant amount of money, you need to consider whether or not you have the discipline to put in the work it takes. This means that, even if you are tired, don’t feel like it, you have to have the discipline to make yourself get to work. It’s not always easy to do this. However, if you are serious about making your home business a success, you need to have the discipline to work on it, even after you come home from your day job, or if you have to get up early on the weekend to do a little extra. Consider how much discipline you have, and whether or not you will be able to force yourself to work, even if you don’t want to. 2. Do You Have What You Need to Start a Home Business? Sometimes, starting a home business requires extra money. Do you have the financial resources to put into the business without ruining your family budget? There are inexpensive businesses that you can start to make money from home. Some home businesses only require that you have a computer and a high-speed Internet connection. Realistically assess your situation, and figure out what you need to make your home business happen. Then, see you have what you need. If you don’t have the time, money, or resources to start a home business, ask yourself if you have the discipline to stick to a plan that will get you to that point. Create a plan that will help you get what you need to start the home business, and then follow that plan. 3. Do You Have the Support? Because a home business requires an investment of time and energy (and maybe money) you need to make sure that you have a support system. This is especially true if you have a family. Your home business will impact your life partner and any children you have. Other loved ones might also be affected. It helps to have a good support system around you if you want to start a home business. This means that you need to talk with your loved ones, and explain the risk and the commitment. Otherwise, when things get tough, you might find yourself alone. Move forward with the support of others if you want to avoid serious problems in your home. If you can answer these three questions in the affirmative, chances are that you are ready to start a home business. Just make sure you are honest about the situation, and realistic about what it will take. If you are truly ready for this adventure, it’s time to move forward. Good luck! I definitively agree that having discipline is one of the most important parts of having a home business. It requires so much more dedication and work than people assume.